Let’s Break Stuff! 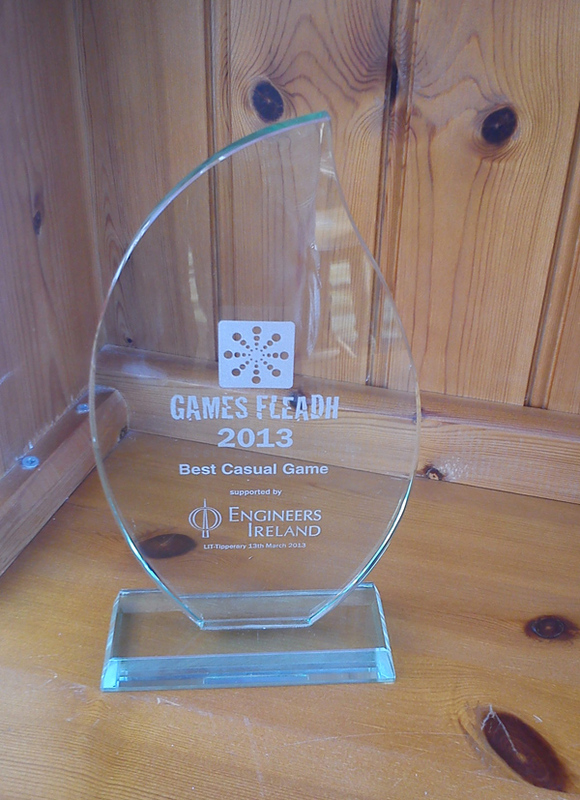 was shortlisted for 2 awards at the Engineers Ireland Game Developer Awards at the recent Games Fleadh 2013 in Thurles. I have been aware of this festival (now in its 10th year) but hadn’t travelled to it before. There’s a lot of impressive work going on there – kudos to Phil Bourke and his team at LIT-Tipperary. Blast your way through waves of asteroids, beautifully rendered in 3D with powerups, shields, and plenty of explosions. Classic arcade action with modern graphics. Includes local and online high-score tables. Take too long on a wave and alien ships will hunt you down – just like the original game from the 1970s. I have been doing some work on, among other things, a tamagotchi/pokemon type game called ‘Monster Melee’. You’ll basically build and train a team of monsters, going hunting against computer enemies and competing in online leagues against other players. Here’s the starting character, Beetlejuice, in the ‘home menu’ environment – this is where you assemble your teams, feed and play with your monsters in a tamagotchi style, and launch your hunting missions.